On March 14, Islamic Jihad fired rockets at Tel Aviv. The Islamic Jihad charter, it is important to note, calls for the ethnic cleansing of Jews in Israel, which it refers to as "Jihad against the Jewish existence in Palestine." This stated objective says nothing about Israel or Zionism. It speaks only of killing the Jews who insist on living in territory they want Judenrein. Territory that according to a reasonable reading of international standards is Jewish indigenous territory. The sole motivation for the attack on Tel Aviv, in other words, is pure antisemitism. On March 15, a white supremacist killed dozens of Muslims at prayer in two mosques in Christ Church, New Zealand. 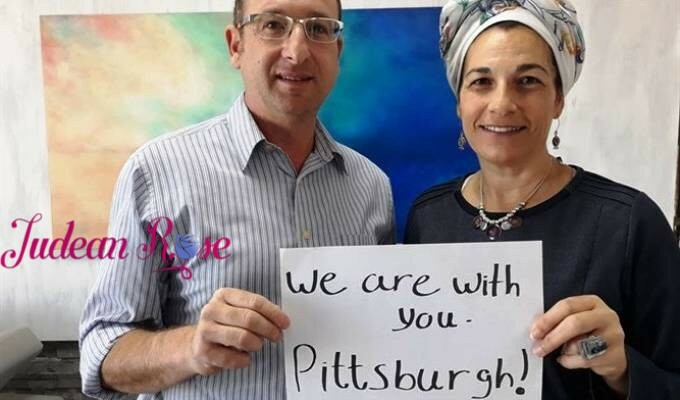 The Jews of Pittsburgh seemed to rise from their somnolence, from their indifference to their brethren in Tel Aviv, rushing to support the people they saw as their Muslim counterparts, victims of an atrocious xenophobic attack on people of a certain faith. The Jews shared memes on Facebook and set to raising funds. They probably didn’t even know about Tel Aviv. Or about all the nights my grandchildren have spent in a sealed room, waiting for the missiles to stop. They probably don’t know about the balloons that tempt my grandchildren with their bright colors, attached as they are to incendiary devices with the intent of maiming or better yet, murdering the smallest, most innocent Jews in Israel, who “occupy” only a fragment of land, and only because they live where their parents live. Two incidents, only one day apart. One incident a crime against Muslims, the other a crime against Jews. An outpouring of support for the one, silence in response to the other. In part, the Jews of America, of Pittsburgh, are not to blame. The media doesn’t care about the Jews of Israel except to demonize them. So the attacks on Tel Aviv, if they were covered at all, were not covered in the same sort of emotional language as the attacks on the Muslims in Christ Church. Then too, we could say that the attacks on Tel Aviv didn’t actually kill anyone. But there is damage, nonetheless. There always is. And it is collective, and cumulative. And we surely could use the support of the Jews of Pittsburgh, every bit as much as the Muslims of New Zealand. The thing is, the Tel Aviv attacks were a big deal here in Israel. It is rare for the city to be under attack. Also, Tel Aviv is the big city. It has a liberal zeitgeist. Tel Avivians see themselves as an island of normalcy. They see themselves as living on uncontested land. They aren’t settlers occupying someone else’s land, so they don’t expect, or as they might put it, deserve to be targeted. My son and his wife and children, on the other hand, live under fire in the town of Netivot, which is located in the “peripheria” as Southern Israel is known to Israelis. The people of the periphery are poorer. They receive fewer services. They are, in some respects, perceived as second class citizens even to their own people: the rest of the people of Israel. The periphery has seen many more attacks than Tel Aviv. But when Tel Aviv is hit, it makes the headlines. My daughter in-law wrote a poignant and sympathetic post in the aftermath the attacks on Tel Aviv. She wrote her post from the perspective of someone who lives in the periphery. Tonight's incidents made me understand that my friends from outside our area aren't always able to understand our lives. Therefore, with much support and a hug (whom other than us, knows how stressful an alarm in the middle of the flow in your life? ), here are a few anecdotes from my life in the Gaza Envelope. Life here... It's a bit more than just alarms. It’s hearing explosions all night, trying to figure out their source. At a certain point you can tell which ones are from Israel, and which are from Hamas. If you're a real expert you can differentiate between tank and fighter jet. It's going to sleep and not knowing what the coming day will bring. It's planning a house in which you leave the shelter unfurnished, so that the whole family can cram in. It's canceling work days because the Home Front Command decided so, and nobody has to compensate you. It's business owners who can't get businesses up and running, as even when times are quiet, one missile comes and destroys the work of many months. It's students who won't be going to school tomorrow, because the alarm in Tel Aviv made them anxious or afraid. It's a poor little girl, a student who was injured by a Qassam rocket that fell on her house without any advance warning alarm, and you want to support or demand and can never find the balance. It's knowing at all times where there's a shelter, including at the market, the playground, and in a car on the road. It's even choosing to drive close to shelters rather than taking a faster route. These attacks on ordinary people, whether in Netivot or Tel Aviv, Pittsburgh or Christ Church, stem from hatred. They come from xenophobia, from an inability to accept the other. This hatred has an effect far beyond the bloodshed. These insistent expressions of hatred makes life painful and difficult. Yes. It is the choice of Tel Avivians to live in Tel Aviv, the choice of the people of Netivot to live in Netivot, just as it is the choice of Pittsburgh Jews to be in Pittsburgh and Christ Church Muslims to be in Christ Church. In a society free of hate, people can coexist, and share spaces. Jews and Muslims, in a society free of hate, can live side by side, no matter who sits at the helm. But hatred makes living side by side impossible. This is our situation in Israel. We are the hated ones. We are hated by the PA, by Hamas, by Islamic Jihad, and those under their sway. The world supports this hate--in Europe, at the UN, in the media-- and tells us we have no right to exist. The world doesn’t distinguish between Netivot and Tel Aviv. It hates us just the same. We are hated by people from within and from without and they attack us on a daily basis whether with rockets or on websites. No part of the country is immune from the terror and the criticism, though some, for instance in Tel Aviv, live under the illusion that they are different, until the rockets hit. But here’s the thing, as a country under constant attack by murderous antisemites, we deserve, from the wider Jewish community, greater knowledge of our situation and support, too. We deserve your interest in our plight. At least as much interest as you extend to the plight of the Muslims in New Zealand. We deserve a more nuanced and intensive look at what is happening to us. We deserve an effort to educate yourselves beyond what the media is willing to show you. And more sympathy than the media is willing to show us. We deserve a modicum of recognition that the constant rockets, missiles, car rammings, petrol bombs, kidnappings, and stonings are born of antisemitism. Hatred is hatred, no matter where or how it rears its ugly head, and no matter how it is covered in the media. And we expect you to know that and to reach out and be a comfort to us in our travails. Just as you comforted New Zealand. Just as we reached out to you. h/t Yitzchak Epstein for translation help.